An excellent turnout for our 2018 AGM walk, which included guests, Chris and Jude. It was also good to welcome Debbie who has been out with the group before. In total, 13 people and two dogs made up the party outside the Oddfellows Arms in Caldbeck, all ready to explore ‘the back of ‘the Back ‘o’ Skiddaw’. Unfortunately two of our regular members could not join the walk, due to injury and accident, however, we would be seeing them later for the AGM and meal. Waterproof trousers were donned at the outset as drizzle had set in and showed no signs of moving on. 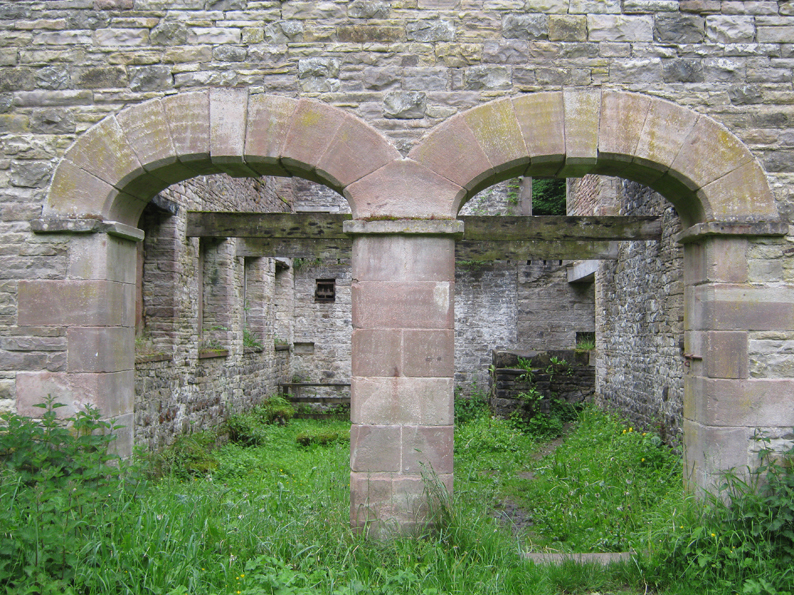 Our route left Caldbeck via the impressive Howk limestone gorge and past the ruins of the former bobbin mill, which was built in the Howk to benefit from the lively waters of the Cald Beck. The mill operated from 1857 until 1924 and made bobbins largely to supply the Lancashire cotton industry. The route continued on pleasant riverside paths to Whelpo Bridge and crossed the Cald Beck. A short section of road walking followed, leading us to Park End, where a series of field paths took us to the remote hamlet of Fellside. A break in the drizzle raised hopes of an improvement in weather conditions and some took the opportunity to remove waterproof trousers and additional layers. The hope was short lived! From Fellside the route headed onto Caldbeck Common and took the bridleway across the shoulder of High Pike. 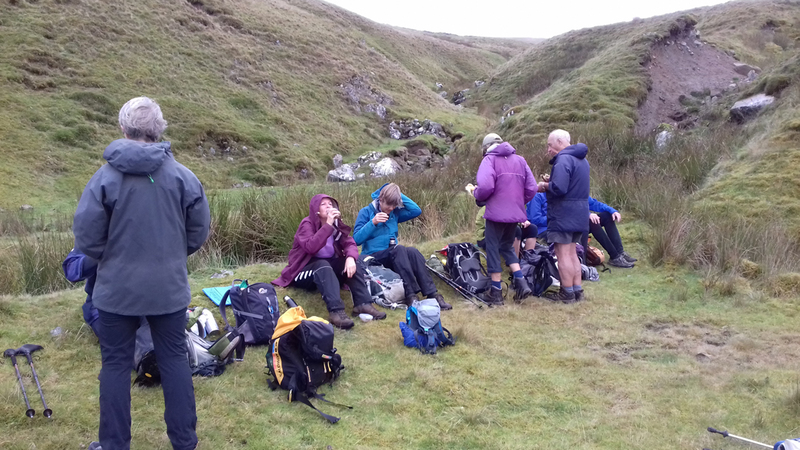 A fold in the fellside, amongst former mine workings, provided a useful coffee stop opportunity. Suitably refreshed, we continued along the bridleway until it met the road beneath Carrock Fell at Calebreck. 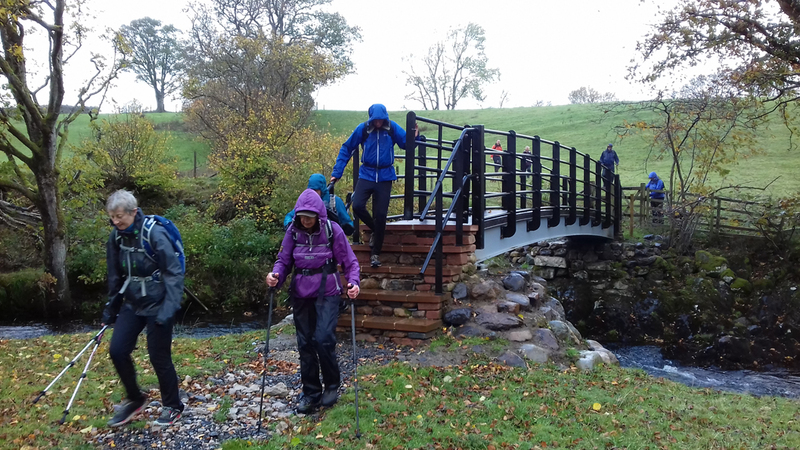 Leaving Caldbeck Common, the route descended and crossed the River Caldew via an impressive new footbridge, possibly a legacy of Storm Desmond. A short climb out of the valley led to Heggle Lane, from where a series of field paths took us towards and through the garden of the evocatively named ‘Bishopspot’. 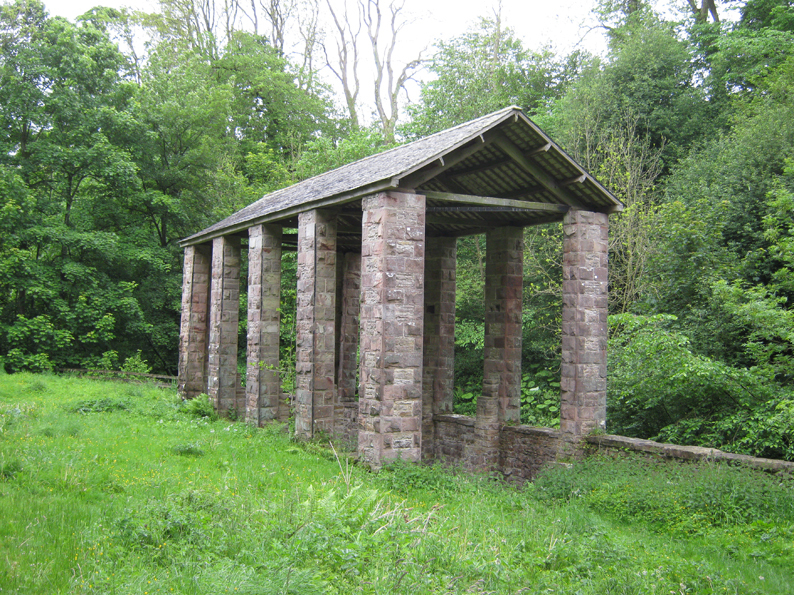 Our lunch stop was taken at Castle Sowerby, St Kentigern, an ancient and isolated parish church. 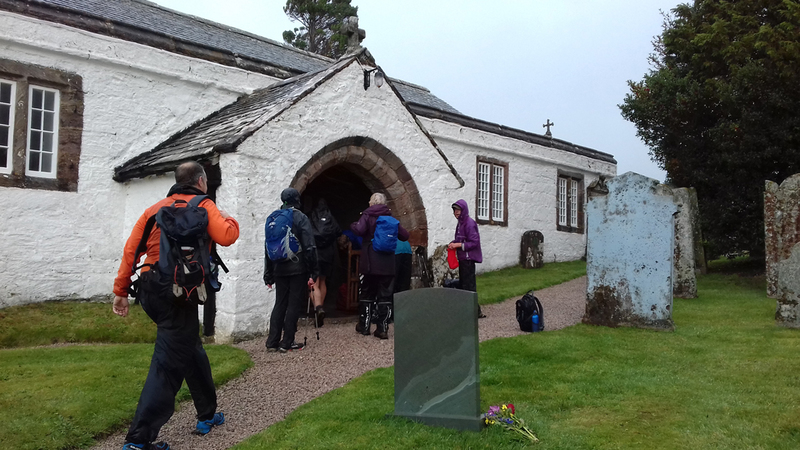 The church porch offered welcome relief from the damp conditions and it was interesting to see how many LDWA members could be squeezed into its confines. The church was open, which offered an opportunity to view the simple but striking interior. 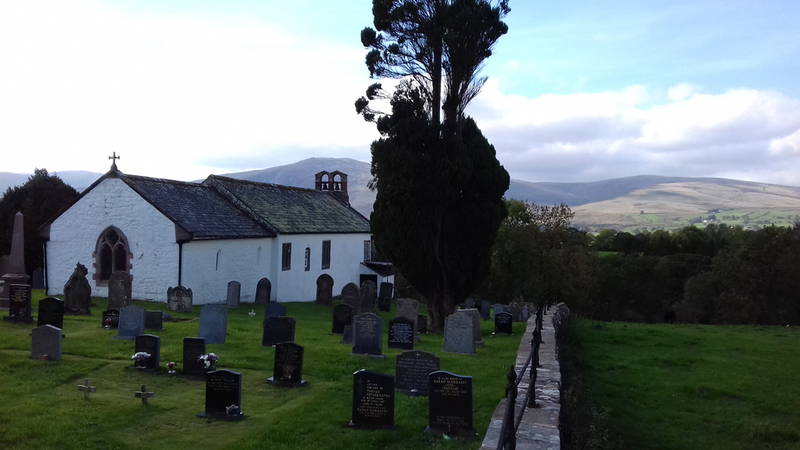 After lunch, the weather conditions improved and it was possible to discern the outline of Carrock Fell, forming a backdrop to the church. Further field paths and short road sections followed, heading north and passing a number of farms and settlements until we arrived at the B5305, Penrith-Wigton road. Turning right at the Sour Nook pub, the route followed further sections of road to reach Sebergham. A fully laden apple tree had shed some of its fruit onto the road and this opportunity was not missed! 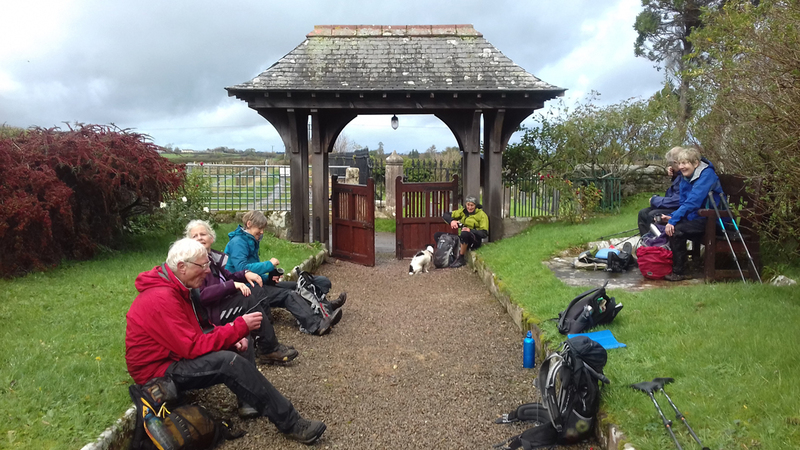 A short break in the churchyard at Sebergham, St Mary, was enjoyed, before the final push back to Caldbeck along the Cumbria Way from Sebergham Bridge. Here we met the River Caldew again and pleasant riverside walking ensued, which was enhanced by the beautiful autumn colours. 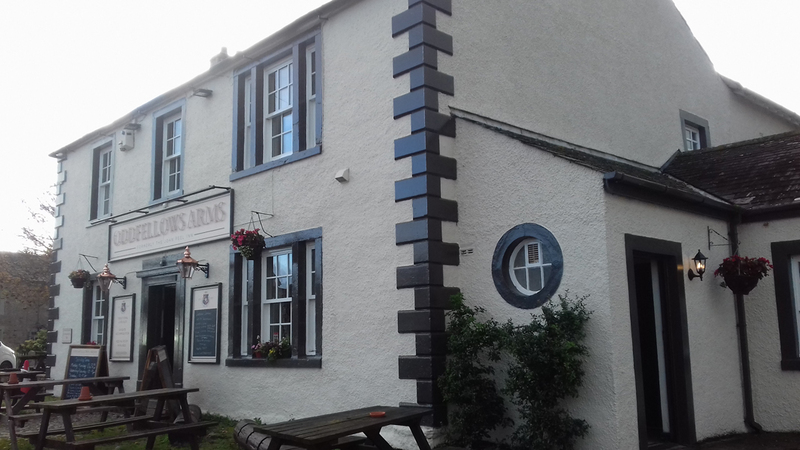 Back at Caldbeck, the Oddfellows Arms provided an ideal venue for our Annual General Meeting and group dinner.